The latest news from OPI headquarters is the launch of the Muppets Most Wanted Collection, which coincides with Disney's 'Muppets Most Wanted' movie! The Muppets Most Wanted Collection by OPI brings you soft and dazzling shades that deliver an animated finish to your paws! There are 8 shades in the OPI Muppets Most Wanted Collection, which launched in Australia and the types of nail formulas include the following: soft pastels, shattered glitters and chrome finishes. Today I have 2 of the 3 glitter nail polishes from the collection to share with you and these are 'Muppets World Tour' and 'Gaining Mole-mentum'! These two shades are my personal favourites from the entire collection as these glitters make my nails look so glamorous and clinquant! OPI Muppets World Tour (L) and Gaining Mole-mentum (R). OPI Muppets World Tour is packed full of micro white and silver glitters of different size with prominent azure blue and pastel pink glitters. This glitter nail polish reminds me of snow falling gracefully from the sky! The glitters are plentiful and abundant that you only need two coats to almost conceal the nail bed. The base of Muppets World Tour is transparent, so this shade would provide a stunning finish as a top coat over pastel shades of either pink or purple. 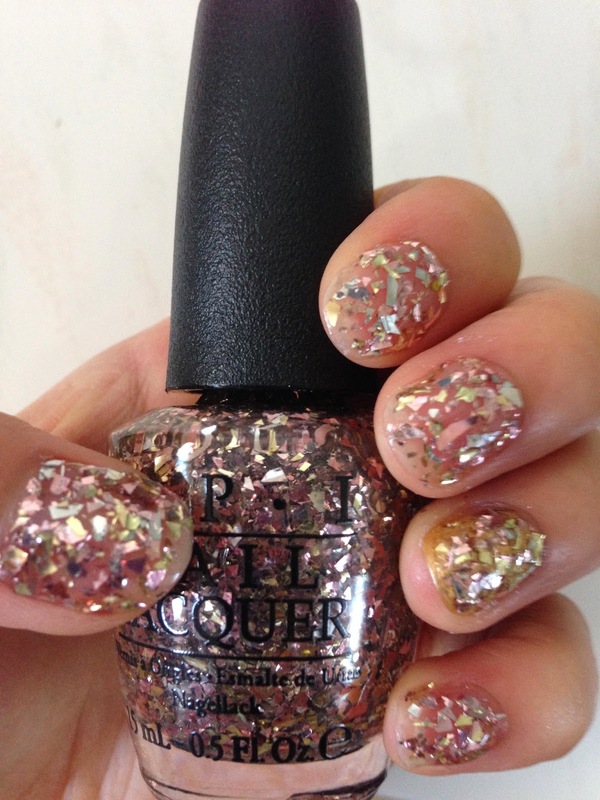 OPI Gaining Mole-Mentum is made up of a burst of light pink and gold shattered glitters, which looks just like shards of multi-coloured glass. I love the effect of Gaining Mole-mentum as each glitter appears to be unique, which looks quite mesmerising! I've applied Gaining Mole-mentum as a top coat on my ring finger nail over a shade of metallic gold nail polish (see photo below). Gaining Mole-mentum looks just as good on it's own compared to using this as a top coat nail polish! Overall, Muppets World Tour and Gaining Mole-mentum are super pretty and unique glitter nail polishes which can be versatile in terms of its use as a top or individual coat. If I was to choose between the two shades, then it would be Gaining Mole-mentum, as the chunky shattered glitters give dimension to my nails! The Muppets Most Wanted Collection by OPI is available in selected Myer, David Jones stores and selected salons nationally from April 2014. Are you a fan of glitter nail polishes? What are your thoughts on the new Muppets Most Wanted Collection by OPI?